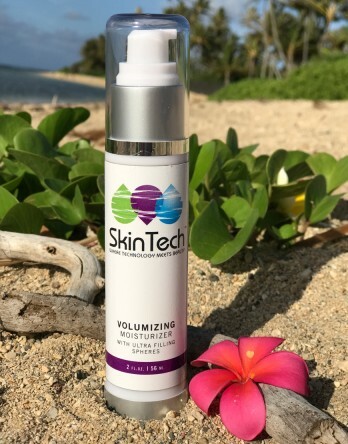 A daily moisturizer that stimulates elastin, smooths fine lines, tightens and firms. It extends the cell life and resisting the natural aging process. It reinforces the bonding between the dermis and the epidermis by stimulating collagen production. Gene targeting peptides stimulates collagen cohesion and address poor skin texture. Ultra Filling Spheres, containing Hyaluronic Acid and Konjac Spheres, penetrate the upper layers of the epidermis, rapidly tightening the skin and smoothing out wrinkles. Skin is left with a supple, smooth appearance and an elastic skin surface with long lasting hydration. May be used day and night, does not have retinol or sunscreen. • Renovage™ - Maintains and delays shortening of collagen fiber, extending the lifespan of skin cells by 30%. Skin functions are improved with an increase of hydration and a reinforcement of the barrier function. Pigmented spots were lessened by -56% after 6 months. Skin recovers its structure with +35% of firmness and +45% of tone in only 1 month, and roughness decreased. Lines, wrinkles and erythrosis (blothiness, redness) were also reduced. • Ultra Filling Spheres - Hyaluronic Acid and Konjac Root Extract increase water absorption, with long-lasting moisturization, smoothing of fine lines and deep wrinkles. • Low molecular weight Hyaluronic Acid - Helps to preserve suppleness, elasticity and tone. • Organic Shea Butter, Mango Butter and Cocoa Butter offer natural moisturizing properties.